Wait, what? Oh, we're just talking about a wolf? Huh. We guess that makes a lot more sense for a toddler costume. We gotta start looking at the picture more closely. Still, we bet this little wolf would be just a fierce as the man who made a name for himself in Montreal. Actually, this little pup might even be more successful. Any smart wolf out there knows it's always better to stay with the pack. Hmm, maybe it's time for a wolf rebellion. We'll be on the lookout for it come the full moon. 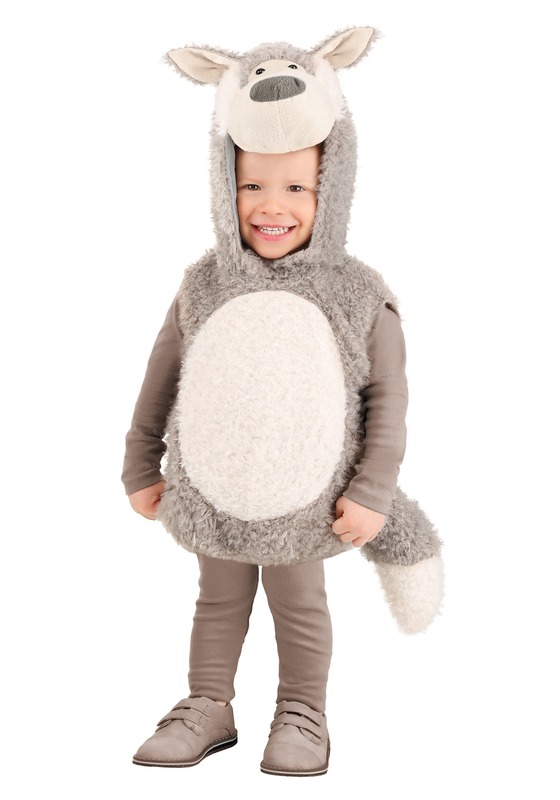 Any toddler is sure to stay cozy in this gray wolf costume. The wooly tunic has a sweet white spot on the belly, an attached plush wolf head, and a tail that your little one won't be able to resist playing with. The hood has a big soft cartoonish nose, little eyes, and big ears. The hood is soft and fleecy on the inside to keep your little one cozy all Halloween cause even little wolves might need a little nap. Is your little one ready to work on their howl? Are the mountains calling your pack home? Pair this costume with all of our woodland creature costumes to make this a look that the whole family can participate in. And don't worry little Red Ridinghood, this little wolf has got more on his plate than bothering some poor girl's grandma. There's a lot of candy to gather this Halloween and with the help of the pack, there just might be enough to fuel a wolfy uprising!